The General Data Protection Regulation – GDPR – is the overall regulation on the protection and handling of personal data. Although the GDPR is for the EU, its impact is global. If you’re an advertiser, publisher, or other Rakuten Marketing partner dealing with customer data, it is vital for you to have a robust compliance regime in place. Below, you’ll find a series of frequently asked questions and key considerations, particularly for those businesses involved in marketing, to help you get to grips with what the GDPR is and how it might impact your business. It’s important to remember that although the GDPR may involve you having to make changes to your data processing policies, it also presents an opportunity. It gives businesses the chance to enhance compliance and demonstrate to their customers that they can trust that their data is in safe hands at a time when privacy is a key concern. The GDPR – or General Data Protection Regulation – is the overall regulation on the protection and handling of personal data for the European Union (EU). The main rationale behind the GDPR is to give consumers more control and visibility of how their personal data is collected and used. The GDPR is applicable from 25th May 2018. My business isn’t based in the EU – do I still need to be GDPR-compliant? Although the regulation is for the EU, its impact is global and extends far beyond European countries. At a simplified level, if your business collects, uses, or processes personal data from individuals in the EU, or offers services or goods to people in the EU, the GDPR will apply. For more detail on this, read our guide: Does the GDPR apply to your business? What happens if businesses don’t comply? Liabilities and enforcement rules are very strict. Fines of up to 4% of global turnover, or €20,000,000 – whichever is greatest – have been promised. What are the differences between the GDPR and current UK data protection regulations? For further details on these points, read our guide – General Data Protection Regulation: Key changes. What are the different required legal bases for processing data? Not only must you understand which legal basis applies to your processing of personal data, but you must also document and be able to prove this basis. How does consent work under the GDPR? In November 2017, members of IAB Europe’s GDPR Implementation Working Group released its working paper on GDPR consent. The paper aims to explain the definition of consent under the GDPR, and the practical implications of using consent as a legal basis for processing personal data in online advertising. Click here to read the paper. Please seek help from a GDPR expert to make sure you are getting consent properly or have identified which processing grounds are appropriate for your business. What do businesses need to do to be compliant? This is a difficult question to answer as every business is different. You may only need to make minor changes to your current data processing policies, whereas others might need to make more significant changes. It’s important to remember that the steps businesses need to take to be compliant will vary, as each business is different. We’ve provided this example to help give you a starting point – you will need to shape your own plan to suit your business needs. It may seem like there’s a lot to do but the good news is as long as you approach GDPR seriously and with enough resource, there is still enough time to be compliant in time for the May 25, 2018 deadline. How is Rakuten Marketing being GDPR compliant? We at Rakuten Marketing take privacy and security very seriously. As such, Rakuten Marketing has been working on our GDPR compliance strategy for over a year to meet as many of the requirements as possible by the enforcement date of May 25, 2018. 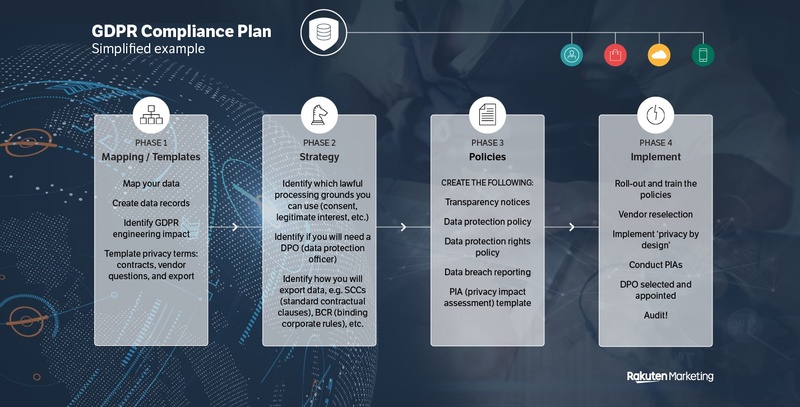 We have identified four phases relevant to our business through which to be GDPR ready: Mapping/Templates, Strategy, Policies and Implementation. Our efforts are ongoing and will continue well beyond the GDPR enforcement date to make Rakuten Marketing a leader in this space, promoting integrity, transparency and trust. If you’d like to find out more about the GDPR and how it might impact you as a marketer, or your business, take a look at our collection of GDPR resources. There are also many independent resources available from organisations such as the ICO and the IAB UK. Find out more in our list of useful links and resources.